We are continuing to witness one of the most hyped, hyperbole-infused, and intensely watched industry battles, or “Religious Wars”, over what mobile platforms will triumph. Ensconced in these wars are a myriad of battles across a very broad landscape of industry titans and emerging disruptors, from Steve Jobs lashing out at Flash, to Zuck’s recent public flogging of HTML5, to the collapse of Nokia and RIM, to the high-stakes patent wars among CE and tech companies. This is surely an epic time in our industry. This war impacts every company on the planet. Importantly, as institutions seek to interact with their users and constituents, they must build applications to reach these users. We’re talking about an enormous impact on IT labor markets on a global basis. In a deflated macro-economy that requires increasing productivity from our workforce, increased global competitiveness for talent, software developers and their choices of which platforms and technologies to build on are having a huge impact everywhere in the world. And this army of technical knowledge bearers may well be at the foundation of what will dig us out of this economic pit. Who or what platform wins? What wins is what gains favor with two constituents: 1) consumers / end-users, and 2) developers; and in that order. With no single company dominating across all categories of devices, app publishers must build for multiple consumer device platforms -- PCs, smartphones, tablets, and smart TVs. To take advantage of these consumer devices and to provide the best user experience and functionality, developers should be building hybrid apps that fuse HTML5 and native code, providing maximum cross-platform leverage, while going native where it counts. More on hybrid apps later. To understand these shifts, let’s quickly review contemporary history on how we got here. The first and most well-understood shift happened with Apple’s launch of the iPhone and associated App Store model for software distribution. Thus began the wave of debate between native apps and open HTML5. The second fault-line occurred as many in the industry responded to Apple by forming an open industry alliance around Google’s quasi-open Android alternative. The debate then evolved to be not just HTML5 vs. native, but iOS vs. Android vs. XYZ OS. With the launch of the iPad came the infamous Steve Jobs assault on Flash, if not Adobe, further forcing choices for developers between native and HTML5. It also signaled that these battles were not just about “mobile”, but also about the future of consumer software on every Internet device. And the proliferation has continued unabated -- smart TVs from Samsung, LG and others; Windows 8 (in its multiple form factors); Xbox and Playstation; and, of course, the great hope offered by Apple TV, which I’ve written about and we have been working on extensively. The discussion and debates that we see in public, in the trade press and carried out on sites like StackOverflow, are just a mirror of the discussions and debates happening inside of nearly every company in the world. Our technical leaders are consumed with these debates. The real answer to these religious platform wars is an ecumenical solution – hybrid apps. It’s not HTML5 vs. native, it’s actually both HTML5 and native. HTML5 is great for rapid, iterative and cross-platform user experiences, especially for apps that involve content. Native gives you power, performance and device features. Hybrid apps give you both – user experience and design with Web development and access to native devices and native code for what’s needed. In many respects, hybrid apps are much like Web apps that involve a front-end and back-end component, with tiers of presentation and back-end logic, and often with tiers of developer and programming language skill sets and related tooling. Over the past several years, a number of solutions have emerged to try and address this quagmire. 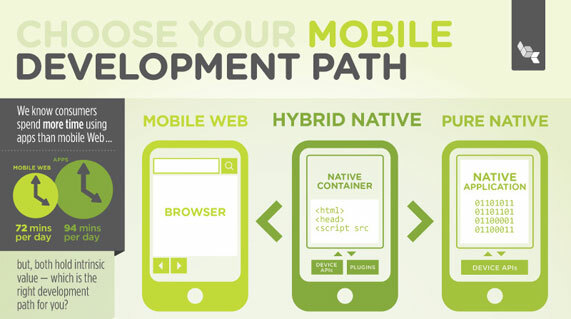 The first of these was PhoneGap, which aimed to offer developers an HTML5-based toolkit for building native apps. Developers could build using the technologies they were already familiar with for the Web, but access key native device capabilities in a cross-platform manner. As an open source tool, PhoneGap grew in popularity. To help get a better understanding of the options and benefits of different mobile app dev strategies, we’ve created this helpful infographic that you’re free to view and share. Click on the image to see the full infographic. With Flash under assault and on the wane, and the industry moving toward mobile and cloud services, Adobe looked to get in the game with the acquisition of PhoneGap (sometimes known as Apache Cordova). This was under the broader context of Adobe looking to protect its franchise in content app development (but using HTML5 tools), and looking to offer more cloud services, with the benefit of their subscription recurring revenue business model. Has Adobe been able to replace Flash for Mobile with PhoneGap? By most accounts, the code-base and features of PhoneGap have evolved little; there are no major new cloud services to go along with it (the PhoneGap Build service, a paid premium service, has been the only offering to emerge, and that was already available in beta when Adobe acquired Nitobi). While releasing the technology into open source under Apache Cordova is an important gesture, not pushing forward and innovating on the framework and associated services is a let down. Part of the result is that the field for hybrid app platforms is very much still wide open, and at a time when global demand for apps is surging and we have a serious labor and talent shortage. For the past 1+ years, we have been re-envisioning what hybrid app development platforms should be like, including not just the app development model, the role of HTML5 vs. native, but also the entire lifecycle and needed infrastructure to deliver a great user experience and get business value from your apps. We’ve just launched a major update to the platform today, including the ability to use native code (Objective-C or Java) within your HTML5-based apps, including a bunch of supported 3rd-party integrations. We're trying to deepen the Native capabilities in Hybrid Apps. We also launched a new Push API that includes the ability to deliver cross-platform push notifications that can be targeted and segmented by user, social group, and other labeled segments. For those of you familiar with other mobile and hybrid app dev models, I’d encourage you to read this developer’s review of App Cloud and PhoneGap. We’ve also published a new comparison guide to App Cloud and PhoneGap. For those of you that are new to Brightcove as an app platform provider, we are many of the people behind great Web development platforms including ColdFusion, HomeSite, JRun, Flash and Flex. We are neutral. We don’t have a horse in the race other than providing great tools to developers to deliver their dreams and innovate for their users. We’re committed to cross-platform support for the device platforms that have broad adoption. We are open. Our core frameworks and container model are free and open source; we’re laddering off and integrating tightly with other popular open frameworks including Node, Markup, and jQuery. We value the right intermix of simplicity and power. Like ColdFusion, JRun, Flash and Flex, we believe in delivering productivity and abstraction while not compromising on control wherever possible. And a big focus is on the developer user experience. We believe that apps are a massive global market and that we are still in the 2nd inning in this game. The result is a surging labor market for app developers, and to meet the massive market demand we believe that Web developers must become an intrinsic part of the app economy. Most importantly, the stakes here are far too high -- we're talking about putting innovators to work in the App Economy, and making every organization in the world more productive!